Mylaporean and veena vidushi Kalyani Ganesan has been chosen by The Music Academy for the prestigious T.T.K. Award. The award, besides others like the prestigious Sangita Kalanidhi award will be given on January 1, 2019 at the end of the Academy’s conference and concerts. A high grade artiste and a respected guru, music has been part of the family’s histories – her husband plays the mridangam and daughter Subha sings and teaches. They run the Hamsanadam Music School in this area. 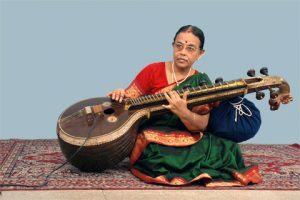 A teacher for over 25 years ( TN Music College where she was professor of veena ) and stints in Singapore) and an artiste who has travelled to many venues, locally and abroad, Kalyani follows a classical gamaka style and appeals to the rasikas who prefer the pure classical style. The husband-wife duo continue to perform. And take classes. Kalyanai was born and raised in Mylapore – a Mylaporean since 1949. This entry was posted on Sunday, July 15th, 2018 and is filed under Arts, People. You can follow any responses to this entry through the RSS 2.0 feed. You can skip to the end and leave a response. Pinging is currently not allowed.